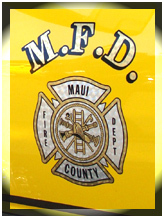 Firefighters gained 100% containment of a fire that has been burning in the Makawao Forest Reserve since Monday morning. Twelve fire fighters from the Department of Land and Natural Resources and crews from the Division of Forestry and Wildlife worked to extinguish hot spots late Tuesday. The forest reserve will remain closed to the public due to safety concerns through at least Thursday, and possibly longer, according to officials with the state DLNR. “We are asking everyone to be conscious of steps they can take to help protect our forest and wild areas by practicing fire safety,” said DLNR Chair, William Aila Jr. “Be sure to extinguish cigarettes, use camping stoves properly and avoid making ground fires. Report any sign of a fire start promptly,” he said. Also on the slopes of Haleakala, the Kula Forest Reserve and the Waipoli Road / Polipoli Access Road have both been cleared of fallen trees, and are now passable. Both locations reopened this morning. 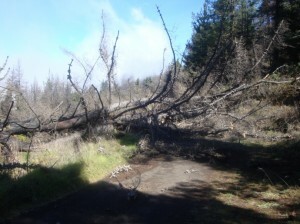 State crews will continue to remove fallen trees and branches in the reserve over the next few days that were blown over during high winds. No injuries were reported.